SCHEDEL - Sexta Etas Mundi. Foliu CXXXV [Text page with S. Hieronymus, the patron of theological learning]. SCHEDEL, H. - Sexta Etas Mundi. Foliu CXXXV [Text page with S. Hieronymus, the patron of theological learning]. Sexta Etas Mundi. Foliu CXXXV [Text page with S. Hieronymus, the patron of theological learning]. - SCHEDEL, H.
Title : Sexta Etas Mundi. 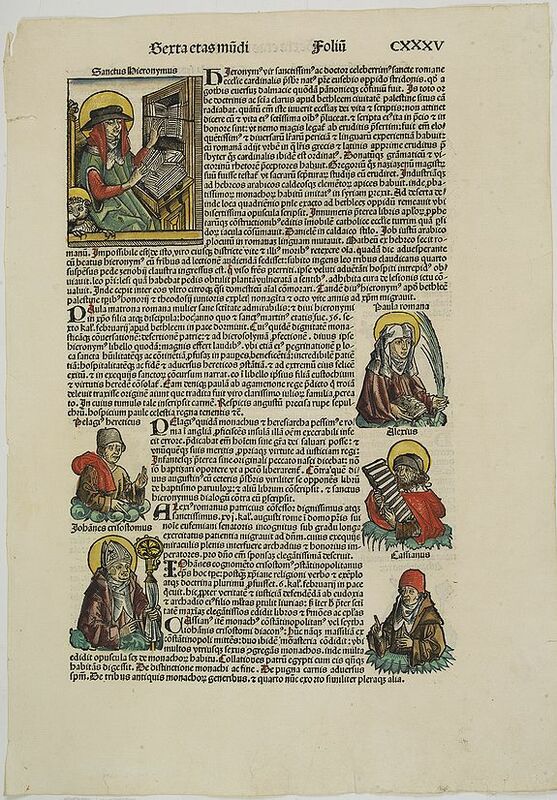 Foliu CXXXV [Text page with S. Hieronymus, the patron of theological learning]..
VERSO is printed with text and images of Popes and Kings. Condition : Some marginal browning. Dark impression on large sheet. Else good condition.